Don't you love it when you get new toys to play with - I'm talking about stamping and scrapping toys. I just got these new chubby flowers and buttons from Close To My Heart - I just love how they look - totally different from any other flowers I have. Also, just got these cute little babies in the flower pots they are part of the Close To My Heart Flower Child Stamp Set Close To My Heart Flower Child Stamp Set - I really like the one in the middle - the baby reminds me of Joey. I made this card yesterday for the Limited Supply Challenge over at Splitcoaststampers.com. The challenge was to make your own background paper - not to use any pre-designed paper or a Cuttlebug. 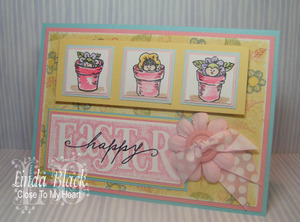 I teamed up these flower pot babies with the current Close To My Heart Stamp of the Month - Eastertime. I also used Close To My Heart Textured Cardstock - each sheet has a CTMH color on one side and a lighter shade on the other. You can see this difference when you look at the pink layer on the back of the card and then the flipped (lighter) pink layer behind the flower pot babies. A little bird told me a big sale is coming next month on the Close To My Heart Textured Cardstock. Stay tuned...Close To My Heart also received several mentions in the Creating Keepsakes 2008 Ultimate Products Guide. Close To My Heart Papers were mentioned on pages 27, 28 and 54; chalks on page 95; Inks on pages 96 & 97 and finally there's a ad for the upcoming Reflections Scrapbook Program on the back cover of the magazine. Close To My Heart also was a winner/runner-up in the following favorite CK "Product Picks" categories: Post Bound Albums, Idea Books, Inovative Products (E-Size Alphabet Stamps), Internet Retailers, Online Ordering, Scrapbook Clubs (joint winner), Scrapbook Kits, Stamping Inks and Stamps. Very cute! Love the stamp set. Love the flower children, they're so-cute!